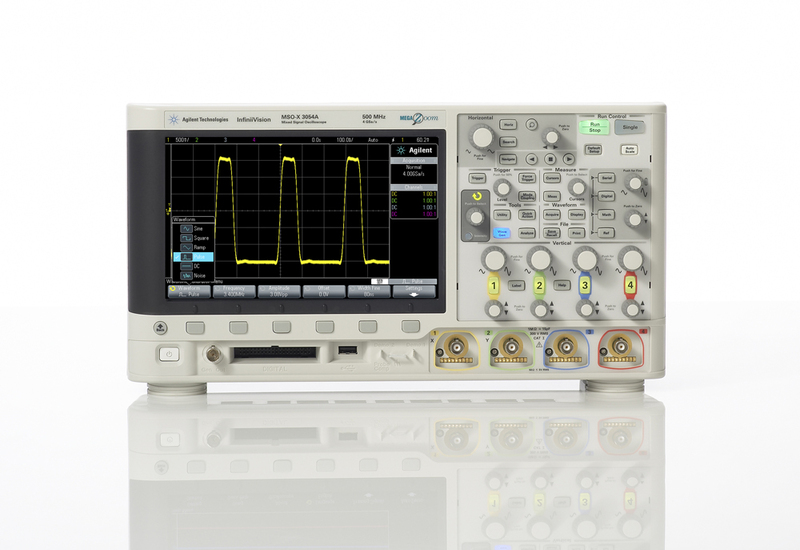 Agilent Technologies Inc. (NYSE: A) has added optional arbitrary waveform generation capability and five new analysis applications to its InfiniiVision 3000 X-Series oscilloscopes. AWG makes it easy for engineers to capture waveforms with their oscilloscopes and instantly convert them to stimulus files to simplify stimulus/response testing. Nine months ago, Agilent was the first major test-instrument vendor to integrate a function generator with an oscilloscope. This integration is popular with manufacturers who want to simplify stimulus-response testing, R&D engineers who need to simulate missing signals and educators who want a simple tool for teaching students about instrument operation. Now the company has become the first to add AWG to its oscilloscopes. Agilent is including this software upgrade - which is used with the integrated WaveGen 20-MHZ function generator option - at no additional cost. With the upgraded AWG software, users can capture waveforms with their oscilloscopes and instantly convert them to stimulus files - and even edit the captured waveforms within the oscilloscope. It's easy to stress a design by adding noise, changing frequency and amplitude, and adding glitches. DSOX3VID joins the 3000 X-Series' million-waveforms-per-second update rate with the triggers, IRE grids and cursors for the latest HDTV standards. DSOX3AERO (MIL-STD 1553 and ARINC 429) and DSOX3FLEX (FlexRay) protocol analysis packages combine hardware-accelerated protocol triggering and display with powerful search and navigation tools. DSOX3PWR adds a broad portfolio of power system measurements, including single-box power supply rejection ratio tests. DSOXADVMATH advanced math functions, including filters, trending and chart display. "We've learned from our high-performance oscilloscope customers that industry-leading performance is just part of the overall measurement chain," said Jay Alexander, vice president of Agilent's oscilloscope business. "Our customers benefit the most when this performance is combined with analysis tools that turn data into insight, and that's exactly what we've done with the 2.0 software." Additional information about Agilent's new arbitrary waveform generation capability and analysis applications for 3000 X-Series oscilloscopes is available at wireless.agilent.com/flash/infiniivision/npl/index1.html. High-resolution images are available www.agilent.com/find/InfiniiVisionX-Series_images. Furthermore, Agilent is running a program where engineers who purchase qualifying Agilent equipment, including Infiniium oscilloscopes, PNA-X network analyzers and PXA signal analyzers will receive a complimentary DSOX3034A, 4-channel, 350-MHz oscilloscope. Details are available at www.agilent.com/find/GetAScopeReward.